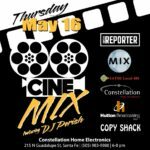 This star-studded cineMIX takes place at CONSTELLATION Home Electronics, Santa Fe’s go-to purveyor of all gizmos and gadgetry related to home theater and electronic wizardry. It’s a celebration of LOCAL film and TV talent, with New Mexico productions popping off of high def displays and bouncing out of bumpin’ systems. Consider how thick and made-out-of-unobtainium the speaker wire should be in your next system while you nod your noggin to the next-level knocks of DJ PERISH. A GRATIS gourmet popcorn bar and custom cinema sweet selection will be served courtesy of MIX. The bar will be the best yet offered by COWGIRL BBQ and MIXers savvy enough to fill out the door survey or bang it out online ( http://bit.ly/16l5pXx ), will earn a drink courtesy of IATSE Local 480, a custom-crafted cocktail made from SANTA FE SPIRITS saintly swill. In honor of the swank productions that hire so many locals, the cocktail concoction shall be dubbed THE LONGMIRE.